999 are an English rock band who formed in London in 1977. They are often cited as one of the first punk rock bands. Between 1978 and 1981, they had five Top 75 singles in the UK Singles Chart, and one Top 40 single. After extensive touring across the Atlantic Ocean, the bands third and fourth studio albums charted in the United States. Despite breaking up a couple of times, they continue to record and play live to the present day. back in the days when this was what punk was all about;not the leather-wearing mohicans,they just ruined it.ace song,ace band! Great song from a great band, one of the classics of the period. I’d rather have 3 mins of 999 than a bucketload of most of the bigger names of the day. 999 bloody great stuff~ They have a real unique sound. 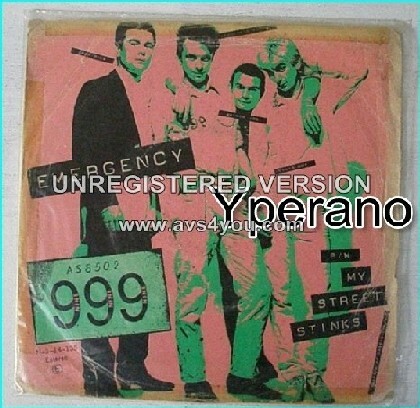 SKU: YP-1402 Categories: All Genres, Punk-Ska-Oi-Punk Rock, Search by Media Type, 7"